What is life? What are we here for? What is truly important? What will bring authentic satisfaction and lasting happiness? We all ask these questions, and we all have a right to come to our own conclusions.In this follow-up to his "New York Times "and "USA Today "bestseller "Jesus Is "____, Judah completes this sentence as to what "life is," revealing how it is to be loved and to love, to enjoy God to the fullest, to trust God in every moment, and to be at peace with God, others, and ourselves. Judah writes as a friend, welcoming to the discussion new believers, lifelong followers of Jesus, and even the merely curious. In "Life Is _____, "Judah shows us the irrational love of God and the life that he intends for us to have in the here and now. With excitement and humor, he looks at the stories in the Bible from a different angle and shows how life is all about loving God and loving others. This DVD is designed for use with the "Life Is _____ Study Guide "(sold separately). 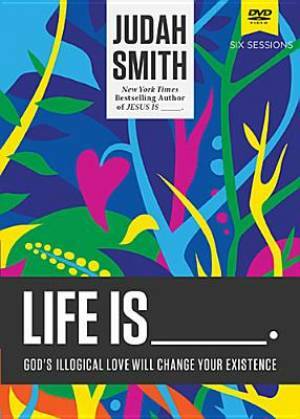 Life is _____: A DVD Study by Greg Paul; Judah Smith was published by Thomas Nelson Publishers in April 2015 and is our 18131st best seller. The ISBN for Life is _____: A DVD Study is 9780718030735. Be the first to review Life is _____: A DVD Study! Got a question? No problem! Just click here to ask us about Life is _____: A DVD Study.